The World Championships for Senior Softball was played in Phoenix the weekend of Oct. 16-18, 2009 with over 361 teams in all age brackets from all over the country. BCT played teams from New Jersey, California, Colorado, Texas and Georgia/Alabama. 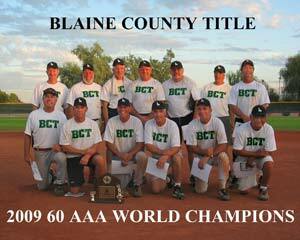 After seeding games BCT entered the double-elimination tournament as the #1 seed and continued its dominance throughout, averaging over 20 runs a game finishing with a 9-1 record and this years 60AAA World Championship. Earlier this year BCT won the Western Nationals in Salt Lake City which qualified them to play in the U.S. Nationals in Phoenix and combined with wins at the Western Nationals, U.S. Nationals, and now the World Championship they won the Triple Grand Slam award as well. BCT placed 5 players on the "All Tournament Team" they are Wayne Clark, Scott Shumway, Bob Hildeman, Bob Sarchett and Jim Pierce. Other members of the team were George Quiggle, Wayne Schmidlkofer, Dave Bixby, Larry Harpe, Larry Hoffman, Dean Merrill and Ken Rhodes.